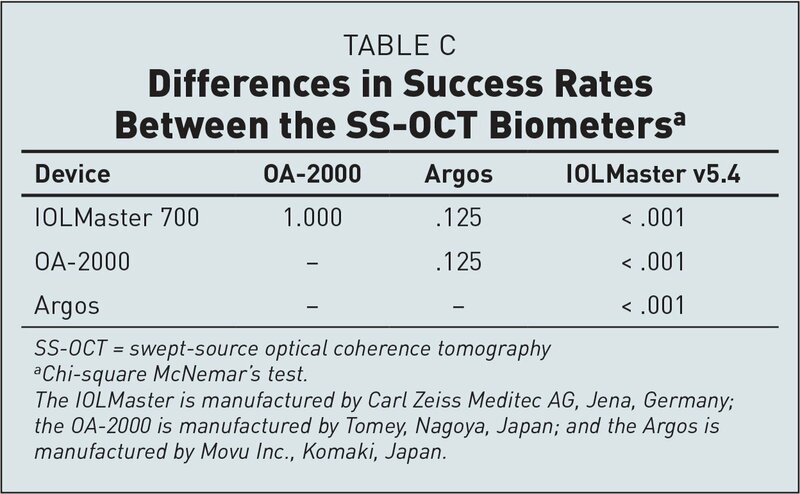 To compare axial length measurements (and failure rate) of three swept-source optical coherence tomography (SS-OCT)–based biometers: IOLMaster 700 (Carl Zeiss Meditec, Jena, Germany), OA-2000 (Tomey, Nagoya, Japan), and Argos (Movu Inc., Komaki, Japan) to those provided by a partial coherence interferometry (PCI)–based optical biometer (IOLMaster v5.4 [Carl Zeiss Meditec]). A total of 119 patients (171 eyes) undergoing cataract surgery were enrolled. Axial length was measured with the four biometers in a random order. Chi-square analysis was used to determine whether statistically significant differences in success rates were found between biometers. Within-subject standard deviation (Sw), test–retest repeatability (TRT), coefficient of variation (CoV), and intraclass correlation coefficients (ICCs) were calculated to analyze the intraobserver repeatability. Bland–Altman plots were used for agreement assessment. Axial length measurements were successfully measured in 166 eyes (97.08%) with the IOLMaster 700, 166 eyes (97.08%) with the OA-2000, 170 eyes (99.42%) with the Argos, and 138 eyes (80.70%) with the IOLMaster v5.4. Chi-square analysis indicated a significant difference in the failure rate between PCI- and SS-OCT–based biometers (P < .001). Intraobserver repeatability for the IOLMaster 700, OA-2000, and Argos showed excellent repeatability with low TRT (0.03, 0.06, and 0.05 mm, respectively), low CoV (0.04%, 0.10%, 0.07%, respectively), and high ICC (1.000, 0.999, and 1.000, respectively). The Bland–Altman 95% limits of agreement were as narrow as 0.09 mm, indicating excellent agreement among the three SS-OCT biometers and the PCI biometer. The three SS-OCT biometers showed a significantly higher success rate for axial length measurement than the IOLMaster v5.4 in various lens opacities. These SS-OCT biometers are likely to become the gold standard for axial measurement. The first commercially available optical biometer was the IOLMaster (Carl Zeiss Meditec AG, Jena, Germany), which was introduced in 1999. It became widely adopted as the gold standard for intraocular lens selection at the time of cataract surgery.1 It is based on partial coherence interferometry (PCI). Good precision of the device has been reported, but the failure rate for axial length measurement is approximately 17.5% to 37.84%.1–5 Optical low coherence reflectometry and optical low coherence interferometry have become available in more recent years, and perhaps perform better in terms of acquisition of axial length measurements in denser cataracts than the PCI-based IOLMaster. Although optical biometers provide additional measurements such as keratometry and provide higher resolution than ultrasound, their application is limited due to the penetration of light. Higher failure rates occur with corneal scars, dense cataracts, and vitreous hemorrhage. Some new algorithms have been applied to increase the signal-to-noise ratio, such as a series of consecutive measurements.6 Swept-source optical coherence tomography (SS-OCT) is a relatively new technique of Fourier domain OCT enabling better penetration. Three devices have become available using this technology: the IOL-Master 700 (Carl Zeiss Meditec AG), the OA-2000 (Tomey, Nagoya, Japan), and the Argos (Movu Inc., Komaki, Japan).7–10 To our knowledge, there has been no comparison of these SS-OCT biometers or an assessment of their repeatability and agreement. The aim of the current study was to compare the IOLMaster 700, the OA-2000, and the Argos to a PCI-based biometer (the IOLMaster v5.4) for axial length measurement failure rates in patients with cataract. Furthermore, the current study sought to prospectively determine the repeatability of the three SS-OCT biometers in comparison to the PCI-based IOLMaster v5.4 and the agreement between all devices. This prospective study enrolled 119 patients (171 eyes) with cataract who were due to undergo cataract surgery at the Eye Hospital of Wenzhou Medical University, Wenzhou, China. The purpose of the study was fully explained and all participants signed written informed consent. The study was approved by the Board of Wenzhou Medical University in accordance with the tenets of the Declaration of Helsinki. All participants underwent complete ophthalmic examinations that mainly consisted of subjective refraction, noncontact tonometry, slit-lamp biomicroscopy, and ophthalmoscopy. The inclusion criterion was adult patients with unilateral or bilateral cataract. The exclusion criteria were: recent history of ocular trauma, severe corneal or vitreous opacities, significant retinal disease, severe systemic disease, nystagmus, or insufficient ability to comply with testing. Following pupil dilation with 0.5% tropicamide and 0.5% phenylephrine hydrochloride (Mydrin-P; Santen Pharmaceutical, Osaka, Japan), each patient was examined on a slit-lamp biomicroscope and the severity of cataract graded according to the Lens Opacities Classification System (LOCS) III.11 The LOCS III consists of different slit-lamp images for grading nuclear color, nuclear opalescence, cortical cataract, and posterior subcapsular cataract on a decimal scale. 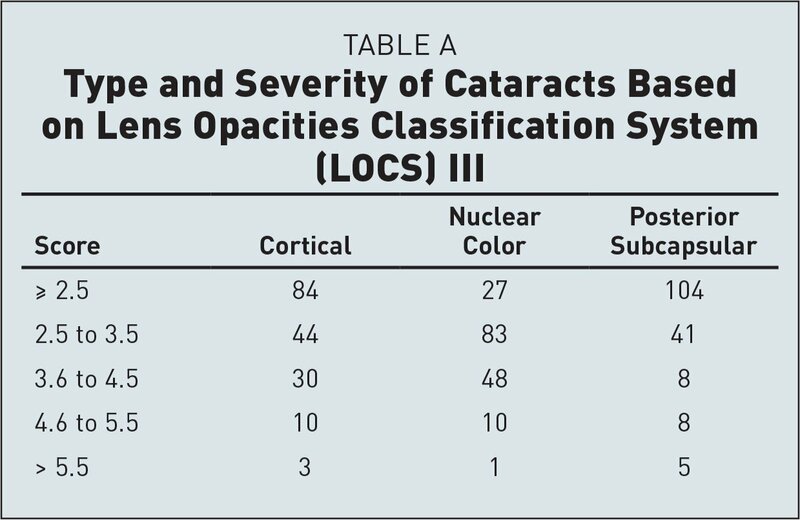 The scale ranges from 0.1 to 5.9 for grading cortical cataract or posterior subcapsular cataract and from 0.1 to 6.9 for nuclear color or nuclear opalescence. Higher scores indicate greater severity. Axial length values were measured following pupil dilation by the four different biometers by the same experienced operator (YL). The order in which the biometers were used was randomized. All measurements were taken within the shortest time period possible and measurements were captured between the times 10:00 and 17:00. The OA-2000 is a biometer based on Fourier domain technology by light interference using a swept-source laser with a wavelength of 1,060 nm.12,13 The OA-2000 performs B-scans for measuring the ocular parameters to find the clearest part of the lens automatically. When blinks are detected, the OA-2000 removes the unsuitable data and retakes the image automatically. The IOLMaster 700 incorporates SS-OCT and a multi-dot keratometer.14 The laser used is a vertical cavity surface-emitting laser with a long coherence wavelength of 1,055 nm. The device provides a 1-mm horizontal OCT scan of the retina to ensure that the measurements are on the visual axis by using the presence of the foveal pit. The Argos SS-OCT uses a 1,060-nm wavelength and 20-nm bandwidth swept-source technology to collect a two-dimensional OCT scan of the eye.7 The Argos displays whole eye real time OCT during alignment to ensure successful measurement. The IOLMaster v5.4 uses PCI to measure axial length.1,15 It uses a laser diode emitting a 780-nm infrared beam of short-coherent light. The composite-20 method was used in the current study, which has been shown to provide more consistent success for axial length measurement than the standard or normal composite-5 method. With the OA-2000, IOLMaster 700, and Argos, at least three reliable measurements were recorded according to the manufacturer's guidelines. Statistical analysis was performed using SPSS for Windows software (version 21.0; IBM Corporation, Armonk, NY) and MedCalc Statistical Software (version 13.0; MedCalc Software, Inc., Mariakerke, Belgium). The Kolmogorov–Smirnov test was used to check that the data were normally distributed (P > .05). The results were calculated for three measurements and presented as the mean ± standard deviation. Logistic regression analysis was used to assess the association between cataract type and severity with acquisition rate. Chi-square analysis was used to determine whether statistically significant differences in success rates were found between the biometers. Within-subject standard deviation (Sw), test–retest repeatability (TRT), coefficient of variation (CoV), and intraclass correlation coefficients (ICCs) were calculated for the three measurements to determine the intraobserver repeatability.16,17 The TRT defined as 2.77 Sw shows the interval within which 95% of the differences between measurements are expected to lie.18 The CoV was calculated as the ratio of the Sw to the mean (the reliability was better with lower values). The ICC ranging from 0 to 1 is commonly classified as follows: an ICC less than 0.75 indicates a poor correlation, whereas an ICC greater than 0.90 indicates a high correlation.19,20 For agreement assessment, paired t tests and Bland–Altman plots were performed and 95% limits of agreement (LoA) were calculated.21 Narrower 95% LoA indicate higher agreement. P values less than .05 were considered statistically significant. One hundred nineteen patients were enrolled and 171 eyes were measured in total. The mean age of patients was 68.87 ± 9.82 years (range: 38 to 88 years). From the 171 eyes, the measurement success rate was 166 eyes (97.08%) with the IOLMaster 700, 166 eyes (97.08%) with the OA-2000, 170 eyes (99.42%) with the Argos, and 138 eyes (80.70%) with the IOLMaster v5.4. The results of LOCS III classification are shown in Table A (available in the online version of this article). 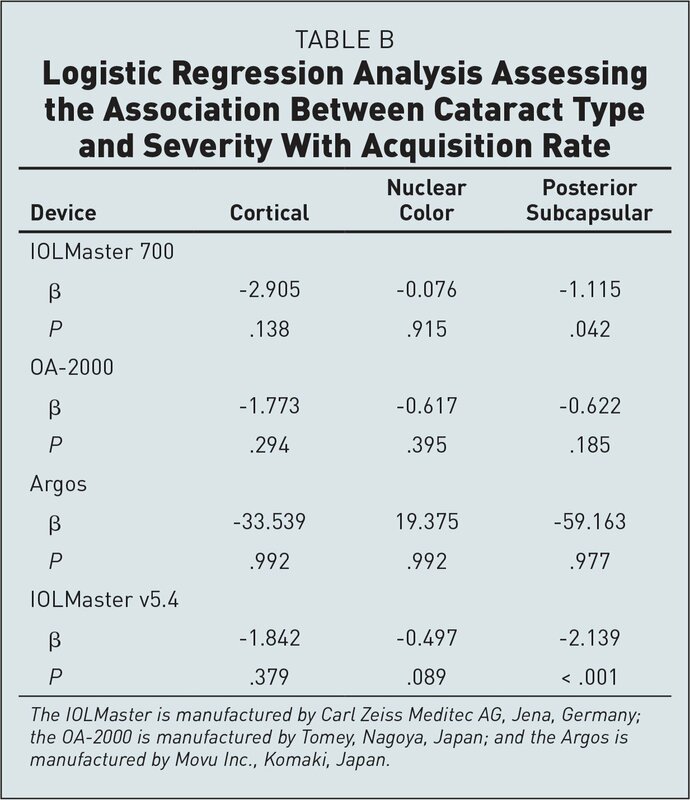 Logistic regression analysis was applied for the association between cataract type and severity with acquisition rate (Table B, available in the online version of this article). The analysis showed no association with cortical, nuclear, or posterior subcapsular cataract with the acquisition rate of axial length measurements with most biometers, but a statistically significant association for posterior subcapsular cataract with the IOLMaster 700 (β = −1.115, P = .042) and the IOLMaster v5.4 (β = −2.139, P < .001). Increased severity of posterior subcapsular cataract was associated with a higher axial length measurement failure rate. McNemar's tests were used to determine whether statistically significant differences in success rates were found between the four biometers with chi-square analysis (Table C, available in the online version of this article). The results indicated significant differences in axial length measurement success rates between the IOLMaster 700 vs IOLMaster v5.4, OA-2000 vs IOLMaster v5.4, and Argos vs IOLMaster v5.4 (P < .001). No statistically significant differences were found between the three SS-OCT biometers. The intraobserver repeatability outcomes of all patients successfully measured with the IOLMaster 700, OA-2000, and Argos are displayed in Table 1. All of the SS-OCT biometers showed high repeatability with low TRT (0.03, 0.06, and 0.05 mm, respectively), low CoV (0.04%, 0.10%, and 0.07%, respectively), and high ICC values (1.000, 0.999, and 1.000, respectively). Excluding the failed measurements, 138 eyes were successfully measured by all four biometers and the results are shown in Table 2. The IOLMaster 700, OA-2000, and Argos showed similar excellent repeatability. The Bland–Altman analysis and LoA (Figures A–D, available in the online version of this article) indicated excellent agreement among the three SS-OCT–based biometers and the IOLMaster v5.4, with 95% LoA as narrow as 0.09 mm (Table 3). In the current study, the failure rate of measurement of axial length with the PCI-based IOLMaster v5.4 was 19.30%. This is similar to previous studies showing a failure rate of 17.5% to 37.84%.2–4 The SS-OCT–based IOLMaster 700, OA-2000, and Argos showed much lower failure rates of 2.92%, 2.92%, and 0.58%, respectively. This difference between the SS-OCT–based biometers and the PCI-based IOLMaster v5.4 was statistically significant (all P < .001 with chi-square analysis), but there were no statistically significant differences among the three SS-OCT biometers, indicating the performance and penetration was similar. Akman et al.14 reported the success rate of axial length measurement with the IOLMaster 700 was 100% and the PCI-based IOLMaster-500 failed in 17 cases from 188 eyes. In a previous study of ours,3 the success rate of the OA-2000 and IOLMaster v5.4 was 100% and 63.93%, respectively. The IOLMaster v5.4 is based on the PCI principle with a wavelength of 780 nm, whereas the IOLMaster 700 uses a swept-source light with a wavelength varying from 1,035 to 1,095 nm. A swept-source light of 1,060 nm is used in the OA-2000 and the Argos. Thus, we believe a longer wavelength of light and improvement of technique may help to increase the success rate for axial length measurements. To obtain reliable axial length values, fixation is important during measurement. When measuring with ultrasound, it is difficult to obtain measurements with respect to the fovea. The PCI-based IOLMaster v5.4 and the SS-OCT–based OA-2000 provide a fixation light for the patient, but it can be difficult to gain repeatable measurements for those with poor visual acuity. In a previous study comparing the PCI-based IOLMaster and the SS-OCT–based IOLMaster 700, 19.6% still showed fixation loss.9 The IOLMaster 700 and the Argos provide an additional image of the complete eye in a longitudinal section, allowing the observer to make sure that the anteroposterior axis falls directly on the fovea. The results of the three SS-OCT biometers showed high repeatability with low Sw, low TRT, low CoV, and high ICC. With reanalysis of the 138 eyes measured by all four biometers, the repeatability was encouraging. The repeatability of the IOLMaster 700 in the current study was similar to that in the study by Kunert et al.,30 who reported a TRT of 0.025 mm and a CoV of 0.03%. As in the current study, the OA-2000 has demonstrated high repeatability in several articles with the TRT varying from 0.04 to 0.07 mm, CoV values varying from 0.06 to 0.10, and ICC values close to 1.000.12,13 The excellent repeatability of these SS-OCT–based biometers is encouraging. As part of the assessment of any new device, it is important to compare agreement among similar devices.31,32 As the results show in Table 6 and in the figures, the mean difference among the four biometers was close to 0 mm without statistical significance. Yang et al.9 found that in patients with myopia and an axial length of 27 mm, the mean difference between IOLMaster 700 and IOLMaster v5.4 was larger, especially for those with posterior staphyloma (mean difference of 0.095 ± 0.182 mm, range: −0.11 to 1.48 mm, P < .001). In our previous study comparing the OA-2000 and the IOLMaster v5.4, the 95% LoA range was −0.05 to 0.07 mm, which is similar to the current study.13 The 95% LoA range between the Argos and IOLMaster v5.4 in the current study was slightly narrower than that reported by Shammas et al.7 The ranges of 95% LoA for the three SS-OCTs were no more than 0.09 mm, indicating their excellent agreement. However, the IOLMaster 700 and the Argos have an additional feature of providing SS-OCT imaging during measurement. Whether it helps to improve the accuracy in specific patients such as those with high myopia requires further evaluation. These SS-OCT–based biometers have demonstrated superiority in terms of the acquisition rate of axial length measurements in comparison to the PCI-based IOLMaster v5.4. In addition, their measurements are also in agreement, indicating they may be used interchangeably. This has the major advantage of reducing the need for less accurate ultrasound-based axial length measurements. These findings suggest a paradigm shift in optical biometry in that SS-OCT–based biometers are likely to become the gold standard. From the School of Ophthalmology and Optometry and Eye Hospital, Wenzhou Medical University, Wenzhou, Zhejiang, China (JH, HC, YL, ZC, RG, JY, YZ, WL, CM, QW); Key Laboratory of Vision Science, Ministry of Health People's Republic of China, Wenzhou, Zhejiang, China (JH, HC, RG, YZ, QW); and the Department of Ophthalmology, Glangwili Hospital, Hywel Dda University Health Board, Carmarthen, United Kingdom (CM). Supported in part by the National Key Research and Development Program of China (Grant Nos. 2016YFC0100200 and 2016YFC0100201); Medical and Health Science and Technology Program of Zhejiang Province (Grant No. 2019KY111); Zhejiang Provincial Key Research and Development Program (Grant No. 2018C03012); and Foundation of Wenzhou City Science & Technology Buereau (Grant No. Y20180174). Correspondence: Yune Zhao, MD ( zyeheye@126.com), and Qinmei Wang, MD ( wqm6@mail.eye.ac.cn), Eye Hospital of Wenzhou Medical University, 270 West Xueyuan Road, Wenzhou, Zhejiang 325027, China. © 2019 Huang, Chen, Li, et al. This is an Open Access article distributed under the terms of the Creative Commons Attribution-NonCommercial 4.0 International (https://creativecommons.org/licenses/by-nc/4.0). This license allows users to copy and distribute, to remix, transform, and build upon the article non-commercially, provided the author is attributed and the new work is noncommercial.